Detailing open hardware and free software for the use and programming of Atmel's AVR family of microcontrollers and boards, including the ATmega8/128/168 microcontrollers, AVR-HID, Byron , various Atmel USB micros, Arduino/Freeduino//alikes and scrying platforms. 3.2.4 __exit is an endless loop. Byron is a flexible, low budget open hardware and free software platform for fast, multiple sensor input and control over USB. Byron differs from other solutions in terms of speed, simplicity and low cost. Using a pre-flashed bootloader, Byron is able to assume new identities, for example functioning one moment as a microcontroller programmer to flash new devices, the next as a straightforward keyboard device. Byron is based on Objective Development's V-USB software. Please visit: byron for more details. To automate compiling and linking of code files. The Makefile can also be used to automate program upload, and disassembly. Not sure where this came from but it's a generic Makefile - only need to change microcontroller and programmer if different from specified (here for the Atmega8). It will compile,link all files in the directory and generate the necessary .hex file. will also upload the code. This section contains static data which was defined in your code. The avr-size program (part of binutils), coming from a Unix background, doesn't account for the .data initialization space added to the .text section, so in order to know how much flash the final program will consume, one needs to add the values for both, .text and .data (but not .bss), while the amount of pre-allocated SRAM is the sum of .data and .bss. The variables __malloc_heap_start and __malloc_heap_end can be used to restrict the malloc() function to a certain memory region. These variables are statically initialized to point to __heap_start and __heap_end, respectively, where __heap_start is filled in by the linker to point just beyond .bss, and __heap_end is set to 0 which makes malloc() assume the heap is below the stack. 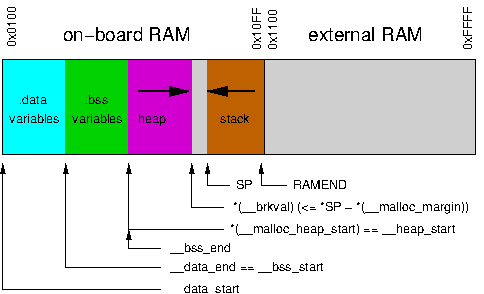 The standard RAM layout is to place .data variables first, from the beginning of the internal RAM, followed by .bss. The stack is started from the top of internal RAM, growing downwards. The so-called "heap" available for the dynamic memory allocator will be placed beyond the end of .bss. and we use memory pointer directly from 1100 - how do we avoid writing over variables (in serialtest.c case). how can we see what is in data and bss (-s switch)? but in the case of serialtest.o we have 621 bytes of data which is all text messages (for help and so on) which we know doesn't get overwritten??? The ld (linker) user manual states that using -Tdata=<x> is equivalent to using –section-start,.data=<x>. However, you have to use –section-start as above because the GCC frontend also sets the -Tdata option for all MCU types where the SRAM doesn't start at 0x800060. Thus, the linker is being faced with two -Tdata options. Starting with binutils 2.16, the linker changed the preference, and picks the "wrong" option in this situation. So, where does sram start on the atmega128? The .data segment (where initialized static variables are stored) starts at location 0x60, which is the first address after the register bank on a 2313 processor. Direct Addressing Mode : For example the 128 bytes of SRAM in the atmel at90s2313 is all directly accessible for reading and writing you can simply specify the address you wish to store data at and read data from in the instruction . The ram starts at 0x60 ( look up previous tutorials to see why ) so after the 0x60 you can simply read and write using the LDS and STS instructions by simply sepcifying the address which goes something like this .. Note also: Because of the Harvard architecture of the AVR devices, you must manually add 0x800000 to the address you pass to the linker as the start of the section. Otherwise, the linker thinks you want to put the .noinit section into the .text section instead of .data/.bss and will complain. How this map translates into hex format? why is data starting at 0064 and not 0060? 0000 12c02cc0 2bc02ac0 29c028c0 27c026c0  ..,.+.*.).(.'.&. note: we don't run check_mem and availableMemory at the same time as availableMemory seems to increase heap size despite the free() call. so data+bss gives 54 bytes. memory on the ATmega8 starts at 0x60 which is 96 in decimal. and running the free memory code alone we see that malloc returns maximum of 959 bytes of free memory! On scrying board, ATmega128 with 512Kb external memory. Integrating editing code, compiling code and uploading to the Arduino/arduino-a-like. Loaded as soon as we edit a .pde file. Both present a standard 10 pin ISP (In System Programming) header. A programmer (see below) is simply attached to the board (in the case of usbasp with a straight 10 pin to 10 pin cable. The left-most of the top right jumpers (vertical) must be closed to allow the board to be programmed! Attaches to the parallel port and only works on (mostly desktop) machines. Connect 1K resistors between the parallel port pins and all wires as follows EXCEPT the GND line of the parallel port (18-25) which is connected with straight wire to the AVR's GND pins. Using code from: http://www.fischl.de/usbasp to program the ATmega8 on the AVR-HID board. ;; attach ISP header/cable to target. Fusebits need to be programmed to make use of external oscillators, brownout detection and other functionalities outlined in the data sheet for the relevant part.